If your pets are feeling bored and in need of a fun-filled day out then bring them to Slater Park, a giant amusement park world where the fun never ends! There are rides for pets of all ages, from the nail-biting Murfin Madness rollercoaster for the daredevils, to the much safer plushie machine where you may be lucky enough to win an enchanted plushie. There's even Fasoro Falls for mini-pets. Afterwards you can wander around and buy a snack at one of the food and drink stalls and perhaps get your pet a balloon to take home as a reminder of the day. Visit the Slater Park balloons shop and restock a pretty balloon for your pet. Have a circus ticket? Complete one of 30 levels of this mission. Complete the Enchanted Plushie Instructions to use this machine for FREE. Take your minipet for a ride on the magical Fasoro Falls and it may change colour. Treat your pet to an unhealthy meal at the fast food shop. Take your minipet for a ride and you'll receive a collectable plate with its photo on. Complete the Slater Park themed goals for a new prize at each level. Compete with other players on the high scores list for a gold, silver or bronze trophy! 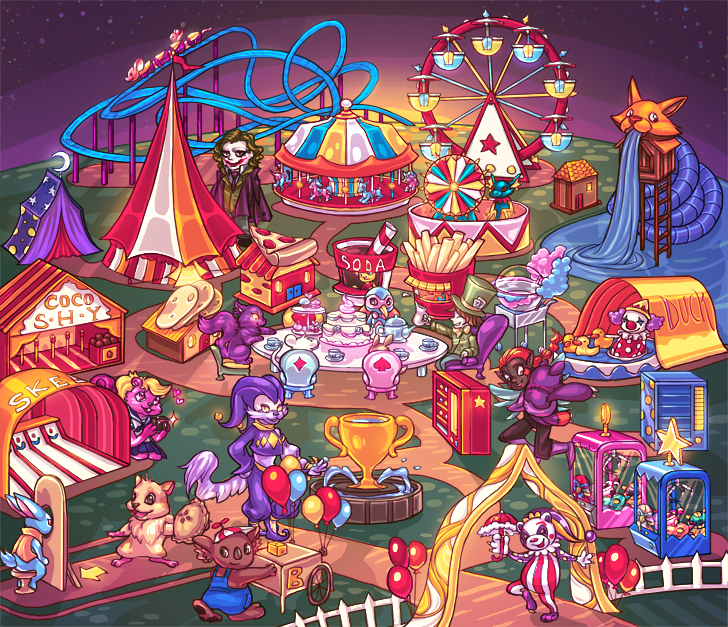 Complete the Jester missions for plates in your collection to win missing gourmet food. Take your pets for a ride on the rollercoaster. You may even win a prize! Play Pie Throw every 2 hours for 500MP. Throw 3 pies at the target to win. Visit this shop to restock pizza items for your pet to eat. The Plushie Fairy rewards you prizes for the number of plushies in your collection. 250MP a play. You may even pick up an Enchanted Plushie! Spend your BP on gourmet potato chips restocking here for your pet to eat. Complete her quests for hidden avatars and win points for her shop. Is your pet thirsty? Buy soft drinks you need from this shop. Complete the Vending Machine Instructions and collect free clothing items.